Nathan has had a cold this past week, and has had a lot of drainage from his nose and a cough. I took him over to my Mom’s before work on Thursday, and he threw up a little shortly after he got there. I called the doctor and they recommended some cough medicine for the poor guy. Well, as the day progressed Nathan started feeling worse and worse so I scheduled a doctor appointment for him at 3:45pm. Unfortunately, my Mom called me at work around 2pm, and told me she needed to call 911, that Nathan was gasping for air and becoming lethargic. I rushed from work to her house and got there in time to ride with him to Childrens hospital by ambulance. 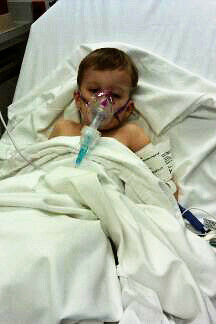 Luckily, when I got there, he was pretty stable because they had put him on oxygen and were starting an IV. My poor boy! I rode in the front of the ambulance with the driver, and WOW, that was one fast and scary ride! He had about five different buttons that made different noises if drivers ignored him or if he had to go through an intersection. We got to the hospital and were greeted by 10 on the staff right away and they put him in a room. Then, they started rounds and rounds of breathing treatments, magnesium in the IV, etc., etc. They ordered a chest xray which showed it was a severe asthma attack onset by his cold. The doctor was really thinking they were going to need to keep him overnight, but Nathan’s blood oxygen levels went up and we were so thankful that he was healthy enough to go home that night. It really was a great hospital, even his breathing treatment mask was the face of a purple dino (can’t really see in this small picture). When we got home, I realized I had left my car running the ENTIRE time we were at the hospital! UGH! My Mom did notice it was on and turned it off an hour before I got back home. And, then, my check engine light came on! Luckily it did turn off so I am hoping my car is ok. I was surprised it didn’t eat a ton of gas. And, of course… Nathan told us today he wanted to do the day ALL over again so he could ride on the ambulance again. KIDS!! !